No, it’s not a nightmare nor a viola (pronounced “vee-o-la”) on drugs. Michael Tilson Thomas said he thought he was hallucinating when he first saw it, dubbing it a Salvador Dali viola. Like pulled taffy heated and then stretched from the top left and bottom right-hand sides, the surrealistic-appearing instrument has caused comments from [Isaac Stern] ”You shouldn’t have left it in the sun so long to [Edo de Waart] ”I thought it was my jet lag.” Rivinus himself has heard it called ‘The Hunchback,” ”The Beast, ” and ”The Gumby Viola” and even claims that someone in the orchestra screamed when they saw it for the first time. The violin maker began working to the model in response to friends with injuries from playing conventional violas. He has been quoted as saying “I am most reluctant revolutionary you can imagine.” He says he was merely trying to put logical design – something that worked – ahead of adherence to conventional design and the result was the Pelligrina. Most violas are shaped like a violin, only larger. 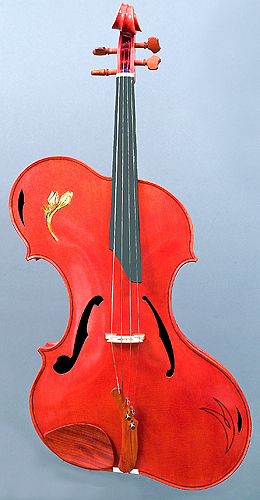 The increased size and subsequent weight makes a viola much more challenging physically than a lightweight violin. The shape works well ergonomically for the smaller violin sizes, but the viola’s expanded width and especially the extra length, present problems for even the strongest player. The weight pulls on the neck muscles. The need to extend the arm to the end of the fingerboard places the arm in an unnatural position and pulls on muscles from the shoulder all the way to the hand. If you didn’t have posture problems before playing viola you will after. I am kind of old-fashioned, I like the tried and true, but since I smashed up my shoulder last year and haven’t been able to handle my sweet-sounding, but very heavy viola, I have been on the lookout for alternatives. There are all kinds of experimentations in the viola world and not a few viola jokes about the difficulties of wielding this large axe, but this model looks like it might have more possibilities than most. David Rivinus’ viola purports to have solve some of these problems by providing a playing position that is less of a strain on the violist by shortening and lightening the instrument without sacrificing a deep rich tone. A slanted fingerboard and tapered sides are supposed to ease the effort required to play and the weight is reduced by the substitution of carbon fiber for the ebony fingerboard and balsa for the internal construction. Other elements are artistic designs to go along with the overall image. Sounds like it might be a good idea. I have never played one of his instruments myself though, so I don’t know for sure. With a price tag of 12,800, I am not likely to either. 😦 Although that is a whole lot better than 175K! I hear there are a couple of them in the Bay Area (San Francisco Symphony – where Tilson Thomas made his famous remark), so perhaps I will have to opportunity to at least see one someday. http://www.rivinus-instruments.com/DesignConcepts.htm shows the design layouts. So often we place form over function . . . women’s fashions (like girdles and high heeled shoes), and violas. I definitely applaud placing function over form whenever it makes us happier or healthier. Great post(s). Did you know that you have two of the same posts up? I forgot to delete the first one. Thanks. The Only Cin has a post up about a Chagall painting. In it, a goat holding a viola. But you are the musician and I defer to your expertise. My oldest nephew plays the viola, btw. He’s awesome on it and the piano. Off to FB to accept your request. I’ll let my nephew read this article himself by sending him the link. Turns out Nathan saw one of these a year ago and had the chance to play it ~ the owner was the coach of an ensemble he was in. It does sound very nice, and it’s surprisingly light. Wow. I am envious. Now if I only had 12K to spare. The first chair (or was at the time I read about him) in the SF Symphony is supposed to have one. He called it white or milk chocolate, but not yet dark chocolate. Milk chocolate is nice, but I am with him. I like dark the best. What a great world. Everything’s going green and ergonomic. I don’t know how green this thing is. I will have to looks mores closely at the parts, but it is ergonomic. Nancy’s nephew (see earlier comments) has actually seen one first hand. Is outlandish the (only) criterion? I was also thinking of the Chocolate Milk Diet one for the Food section and the 5,000,000 used car one. No, I don’t think that all posts need to be outlandish. Humor seems to be a fairly constant thread, but is not present in each post. Something a bit “eclectic” (like this), and the car, and the chocolate milk diet would probably all work. This is quite fascinating Carolyn, an into into a world I know nothing about. Thanks Cindy. I had read about this before and thought what a great idea to put on the blog.